Bleibe ich da bis Freitag.Trotzdem hab ich wenige zeit alle Freunde zu sehen,freue mich auf euch zu gruessen. Aber um wahrheit zu sagen,moechte ich dir sehen! 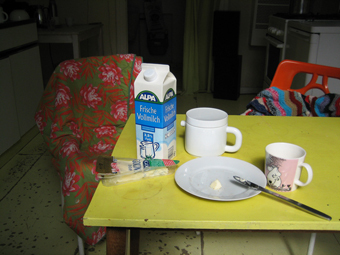 I’m beginning writing a blog being called here “diary” in passing of my artist web site’s renewal.As several friends requested,here will be photos from my exhibitions that wouldn’t be uploaded on main pages and I’m aiming write down what I feel and what I find in my usual life. For sure diary could suit my purpose.Regarding the language,I’d like to use Japanese,English,German and French(when I get better improving…. ).The choice of language depends on the contents of diary!Excuse me but here could be mostly Japanese dominated, I just love to write in it.Ah plz don’t mention to my poor English!For me English is the language for communication, therefore actually quite limited…hmmmm doesn’t matter.By the way,the photo above was taken on a day after coming back from Tokyo in this summer.It is special “Red Shoes”of Giuseppe Zanotti(my addiction! 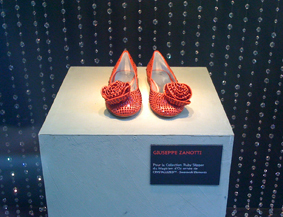 ),displayed in Galerie Lafeyette.There were lots of Red Shoes by top-maisons as well.I could feel I was welcome by Paris. Anyways enjoy my site and coming diaries!